Coolen, Ralph Freeman, 94, of Moose Harbour, Queens County passed away peacefully on Thursday, September 2nd, 2010, in the Queens General Hospital, Liverpool. Born in Liverpool, he was a son of the late Lemuel and Juna (Freeman) Coolen. 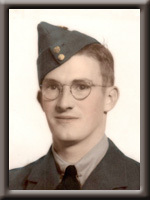 Ralph was a veteran of World War Two serving with the Royal Canadian Air Force. Following the war, he was a fisherman before working with Mosher and Rawding Construction and then with Mersey Seafoods Limited of Liverpool. He enjoyed gardening and was an avid “Blue Jays” fan. He was a member of Grace Anglican and Trinity Anglican Churches and was a life member of Mersey Branch #38, Royal Canadian Legion, Liverpool. He is survived by his daughter Virginia (Bob) Sanford of Liverpool and his son Reginald (Phyllis) of Mersey Point. Step children:Lynn Tilly and William Tilly, both of Windsor; Phyllis Scuntry of Edmonton. Seven grandchildren; three step grandchildren, seven great grandchildren, several step great grandchildren and two great great grandchildren. Sister-in-law Mary Tilly of Windsor. He was predeceased by his second wife Maxine (Tilly); son Gregory, brother Karl and stepson Philip. Sorry to hear of Ralph’s passing He did get to live a very full life. I was shocked to hear of Ralph’s passing. Please accept our deepest condolences. I saw him only last week. Ralph was a fixture at our store, visiting almost daily when he could drive and often after he couldn’t. Ralph and I had a few toe to toe sessions with his strong will against mine but he was a great old guy and remained a true friend of all of us at Memory Lane. We all celebrated his birthday with a cake last month as in each year for the last ten years or so. He will be truly missed as will his love of technology and exploring the latest gadgets. Ginny & Reg: So sorry to hear of your Dad’s passing. Our condolences are with you at this very sad time. We are so sorry to hear of Ralph’s passing. Our thoughts and prayers go out to all of his family. I am very sorry to see that you have lost your father. Sincerest condolances. We were very sorry to here of your father’s passing. It’s hard to find the words to say how much we will all miss Ralph. We’ve known him more than 10 years and over those years we’ve become good friends. I always loved his stories from days gone by, whether it be dancing to Don Messer, his many years of working construction, or reminiscing about his family and seeing his eyes tear up when talking about his grandfather, Robert Coolen. We always looked forward to his daily visits to our shop (Memory Lane) when he still had his license and we even had a special chair just for him. Thanks for sharing Ralph with us, we will all really miss him. When he still could drive Ralph would be at the store (Memory Lane) pretty much every day. When he’d leave I’d always say, “See you tomorrow, Ralph”. He’d always answer with, “Well, at my age I can’t make any promises!” I loved his stories. I’ll never forget the time he was one number away from $1 million on Atlantic 649, lol. He ended up with $649. He talked about that for a long time, and he’d still mention it once in awhile. He sure liked his gadgets, it will be strange not showing him the new toys. He will be a huge miss for sure. So sorry to hear of your Dad’s passing. We will miss seeing him and waving as we passed his home. Our thoughts are with you all. I was sorry to hear about your father. My thoughts and prayers are with you and your family. We are sorry to hear about your loss. Our thoughts and prayers are with you.